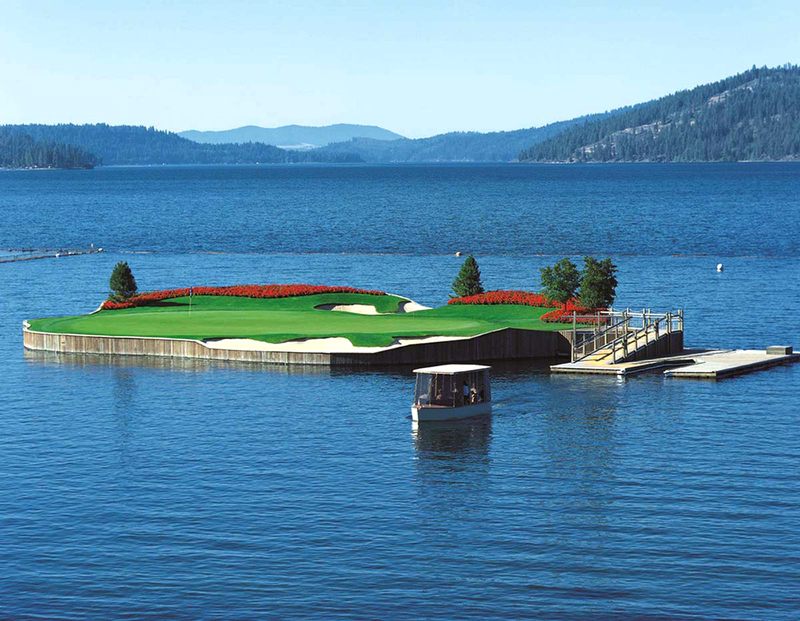 Snapshot: The Golf Course at Coeur d’Alene Resort in Northern Idaho features an island putting green accessed by boat. 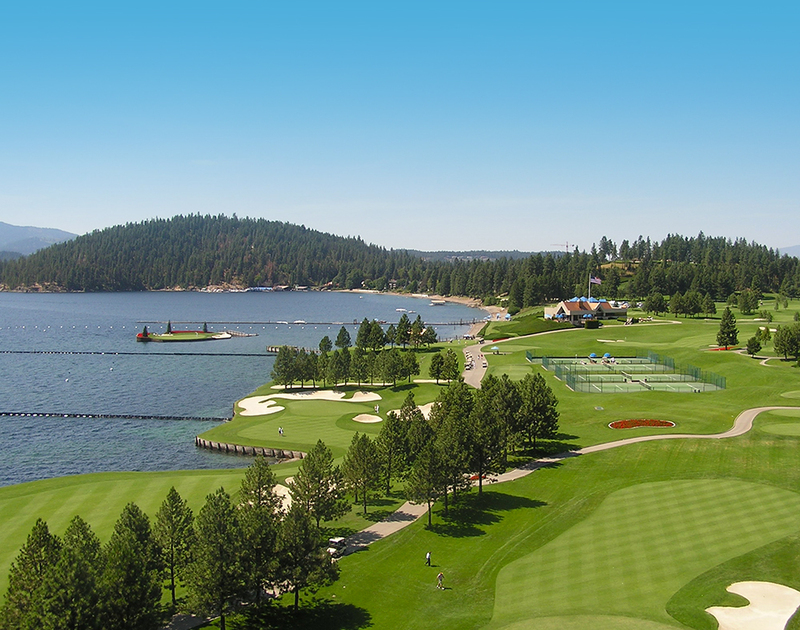 The island green has helped to establish Coeur d’Alene Resort Golf Course as one the nation’s premier golfing experiences. 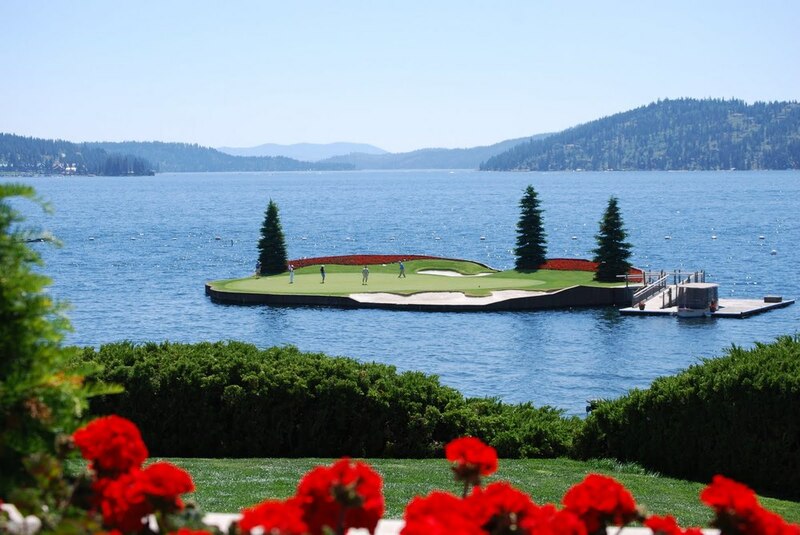 Secluded in a valley of tall pines and sloping hills is the ideal vacationing spot of Northern Idaho’s Lake Coeur d’Alene, whose Coeur d’Alene Resort Golf Course brings its own version of “water sports” to play. Inspiration came to Duane Hagadone one day when, while walking his dog, he glanced out over the waters at a tugboat hawling a raft of logs, which gave him a vision of a floating island on which he’d place a golf putting green. Bodies of water of varying depths, lengths, and widths have always separated fairways from greens and upped the golfers’ challenge, but this is almost a new game in its own right. Pier-like wood rimms the small surface of the green and adds an appropriate nautical touch to an island that is otherwise divorced from the water, a verdant oasis floating amidst, but detached from, its sisterly, landside greenery. Three pines plant a firm bond with the enormous pines foresting the lake, and these pines lie on the border of bed of carefully planted and kept red flowers. These beds in turn border the lawn upon which golfers depart from the dock onto the playing grounds. The design is by no means a bare-bones structure: as mentioned, water is a staple of the game that is, of course, everywhere; but there’s two large sand pits as well, as if hitting the ball onto the green wasn’t hard enough already. There’s no rest for the posh, it would seem. There’s a great use of colors for (a) such a small area and (b) a golf course. A birds-eye view shows that even the dock adds to that color scheme, and not only with its rustic nautical worn-wood look. The mahogany boat ferrying players to the green fits like a puzzle piece (literally) into an arrow-shaped cutout of the dock, and when the boat isn’t anchored, there, that arrow shape is “colored-in” by the blue water beneath it. The dock is totally transcends the realm of functionalism--getting golfers to the island--into the realm of the downright charming. Golf may be two-parts spectator sport, but the of the location of this green is four-parts spectator photo-op, for no matter where you are around its watery periphery it can be centrally located within a great shot of the surrounding areas. A picture taken from the Southwest would show little out of the ordinary in regards to a typical golf course layout, albeit one curiously designed. From the Southeast, though, the island accentuates the allure of the resort proper, clarifying to visitors that there’s much in the way of a unique experience here at Coeur d’Alene and they should definitely book a spot. From the Northwest, the green sits in the foreground of the magnificent sloping hills hemming in the lake and from which the town is accessed via the freeway, while from the Northeast and East, it lies just below a horizon of rural lakeside mansions that line the Western shore. All of this and more has helped the Coeur d’Alene Resort Golf Course to be called by Golf Digest “America’s Most Beautiful Resort Golf Course,” and that is a title backed up in multiple ways, from the location to the landscaping. Previously the most posh field sport, Golf is now the most charming water sport as well.